Photography & Styling Credit for all photos in this post: The lovely and multi-talented Ellen Kyle of Found & Created (an innovative floral / paper / design studio). Check out her amazing work! Roasted potatoes: So simple, yet so very tasty. Their complex, mouth-watering aroma belies their simple preparation. And you can quickly add dimension to this simple side dish via a handful of fresh herbs: texture, bright color, and a summery, herbaceous flavor. A handful of hulled hemp seeds provide healthy omega 3 fats. 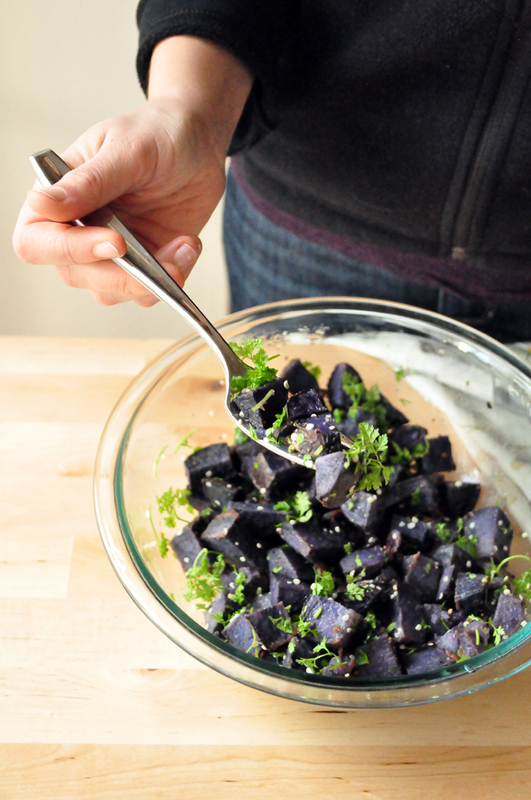 Why blue potatoes? Just for the heck of it! I'm always happy to be one dish further from a common fate: a plate of brown food. Ditch those sepia tones. Live in color! This is an easy recipe that takes care of itself while you work on the main dish, and it's versatile; you can dress it up with a variety of fresh flavors. Read on for notes and ideas for using fresh herbs, instructions for roasting potatoes, and a recipe for making the tasty salad pictured in this post! This satisfying oven roasted potato recipe is a side dish packs real flavor without much real work. Learning how to work with fresh herbs is a worthwhile pursuit. They let you build more healthful meals by shouldering the burden of flavor complexity while taking the spotlight away from oil and salt. They also multiply your recipe repertoire, considering the bounty of fresh herbs now available at most markets. A choose-your-own adventure of flavor combinations awaits you for as many times as you'd like to make this dish. Each time you toss the greens in, you'll end up with a substantially different side dish. 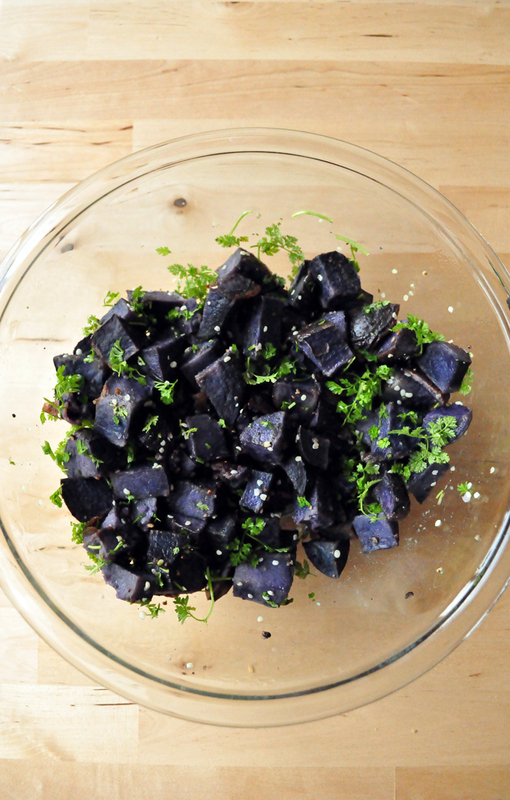 Oven roasted blue potatoes with hulled hemp seeds and fresh chopped chervil. Most people don't venture into the fresh herb isle unknown, either because they don't know how to use fresh herbs, or because of sticker shock. If you don't have a garden, the most economical place to get herbs is usually at a local farmers' market. The most economical time to buy them is when they're in season (spring and summer), so spring is a great time to start lining up your recipe ideas. When you're new to an herb, it never hurts to do a quick wikipedia search to understand the ways it is most commonly used. You can also become familiar with the herb by trying a few fresh leaves and thinking through familiar dishes that it might pair well with. A basic base like pasta or potatoes with a little oil, salt, and pepper can also serve as a showcase for a flavorful herb. 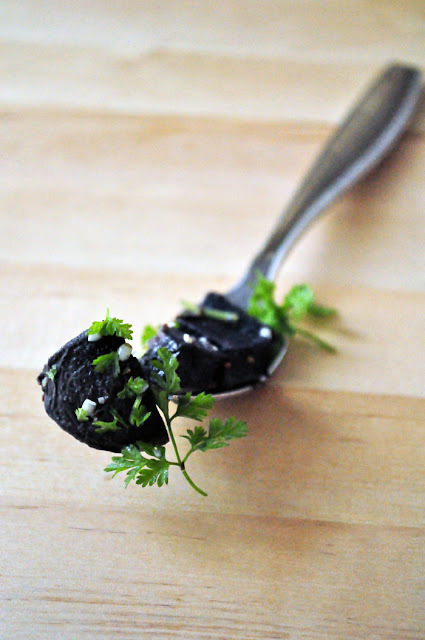 The flavor of fresh herbs is often very different from dried herbs: brighter, lighter, refreshing, and more complex. This is because when these plants are dried, many of the compounds that provide their flavor are not preserved. Some herbs (chervil, for example) have a very delicate flavor that quickly fades with prolonged exposure to heat or when incorporated into a dish with other strong flavors. Consider adding such herbs to a dish just before serving. While I don't go into depth on any one herb here, I hope this information emboldens some of you to grab a bunch of fresh tarragon or chervil the next time you buy groceries. This is an easy paleo side dish for people who accept potatoes as part of a paleo diet. For those who are reading because they follow a paleo lifestyle, it's worth noting that the potato is a tuber that generates much disagreement among the paleo community. Some consider it off-limits. Some don't mind potatoes in moderation, and others are fine with any healthful preparation of potatoes. I assume you're here because you're in one of the latter camp and are interested in exploring new recipes. 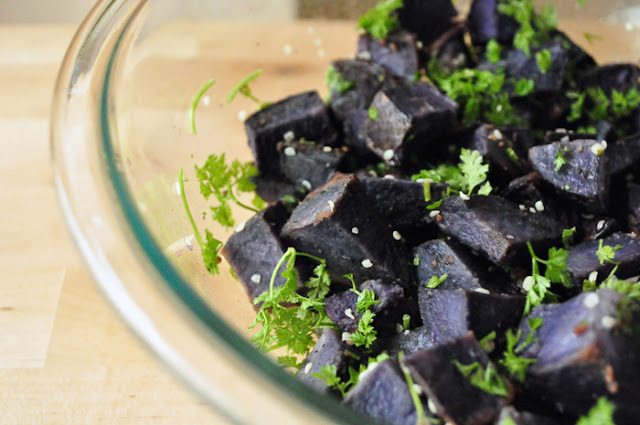 But if you're on the fence, you should know that blue potatoes pack a little benefit their pale cousins lack: Their blue color comes from anthocyanin pigments, a flavonoid believed to have antioxidant effects and other potential health benefits. Look at those colors! 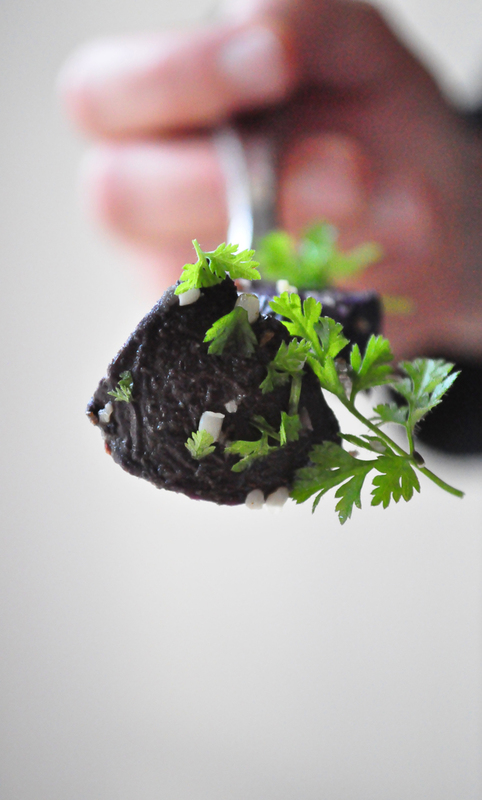 A beautiful and easy side dish. In any case, it never hurts to add a few more easy side dish recipes to your file. This is a simple recipe that can take care of itself while you work on the main dish. And as a bonus, you can practice dressing it up with fresh flavors. 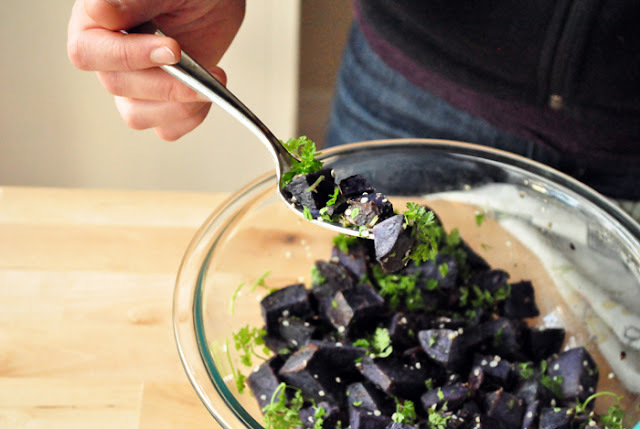 Oven roasted potatoes become a whole new side dish when you use blue potatoes and fresh herbs. 1/3 cup chopped fresh herbs (see below for ideas). For strong aromatic herbs, like rosemary, use less (appx 2T). If you like brightness and acidity, consider adding a squeeze of fresh lemon. Halve the potatoes if they're small, quarter them if they're large. Toss the potatoes with oil, salt, and pepper until they're evenly coated, and spread them out across a sheet pan. By making sure they are spread out into a single layer and not overlapping, you'll be helping steam escape from the potatoes which encourages browning and a crispier exterior. Optionally line the pan with foil or parchment paper to make cleanup easier. Place in the heated oven and roast for 45 to 60 minutes, or until crisp and brown. Twice during the baking time, use a spatula to flip and turn the potatoes so they bake evenly. While potatoes are baking, wash and finely chop the herbs you'll be using. In the photos above, I've chopped mine a bit too coarsely. Remove potatoes from the oven and toss with chopped herbs and an optional squeeze of lemon juice. Taste a potato section and adjust salt and pepper as needed. Serve hot. This oven roasted potato recipe with fresh herbs is an easy side dish. I hope this recipe inspires some you to experiment with fresh herbs in your vegetable dishes, pastas, and salads!